I love everything about this!! Really beautiful. Oh so pretty!! Nice use of the washi tape. I have tons and always forget about it. 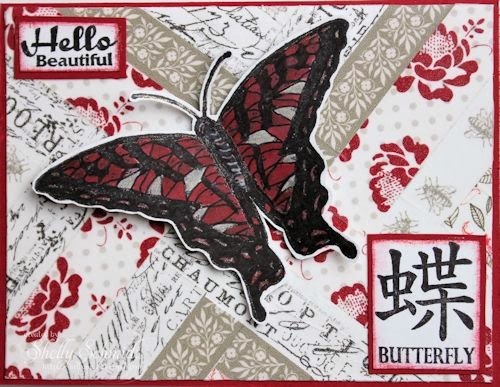 this is gorgeous Shelly love that butterfly and your Washi looks awesome.....have finally bought some and have yet to use it...feel better soon. Shelli this is a Beautiful card!! I love the herringbone background! OH Shel, stunning this is! I'm convinced that you are a total master of the Asian inspired arts!! This is gorgeous Shelly, I love it!! How beautiful. I love this technique. Your colour scheme is so pretty, and so oriental. Hope you feel better soon. shelly, shelly, shelly... this is absolutely gorgeous! gorgeous! i love the colors here and the use of the washi tape! you are queen of anything asian! i sure hope you're up and about and feeling better real soon. Oh this is absolutely breathtaking, Shelly! I love that background and the butterfly is stunning! Hope you are feeling much better! gorgeous! sending get well wishes your way! What a gorgeous card! I love the washi tape background. Beautiful technique. I sure hope you are felling better very soon. It's awful to not feel well for so long. I'll keep you in my prayers! Have a wonderful week! Thanks for submitting it to the MFP Color Challenge this week. Absolutely stunning Shelly - love the drama of the gray and red together. Hope you are better soon - and what a way to crash diet :-(. Shelly, wow! This is beautiful! What a fabulous card and very creative use of the Washi tape. Your butterfly is so gorgeous. I hope you feel better soon. Wow, Shelly, sorry to hear you are not feeling well. Try a little Ginger Ale. I even spike mine with more Ginger. I learned about Ginger being good for that from Jackie Kalchert. Your card is stunning. I love the tapes and the pattern you did! The butterfly is gorgeous! Beautiful card, love the washi tape background!!! Thanks so much for joining us at Sugar Creek Hollow! This is absolutely gorgeous! I love the beautiful washi tape background - so creative! Thanks for sharing with us at Sugar Creek Hollow.